If there’s one thing you’ve likely picked up from reading Pizzazzerie, it’s that I love parties – and CHOCOLATE. You too? You’re in the right place. I’ve had the pleasure of being a part of the Lindt Chocolate Blogger Council for a couple of years, and I’ve learned so much about chocolate and how it’s made. One of my very favorite ways to eat chocolate is “pairing style” with some of my other favorites, namely wine, cheese, etc. Now we’re talking, right? Why not host a chocolate pairing PARTY? Host your friends and guide them through a chocolate and food pairing. I’ve rounded up some of my favorite pairings as well as tips for your own pairing party. First, let’s get down to my favorite chocolate pairings, shall we? That is the most important part of your pairing party, after all. 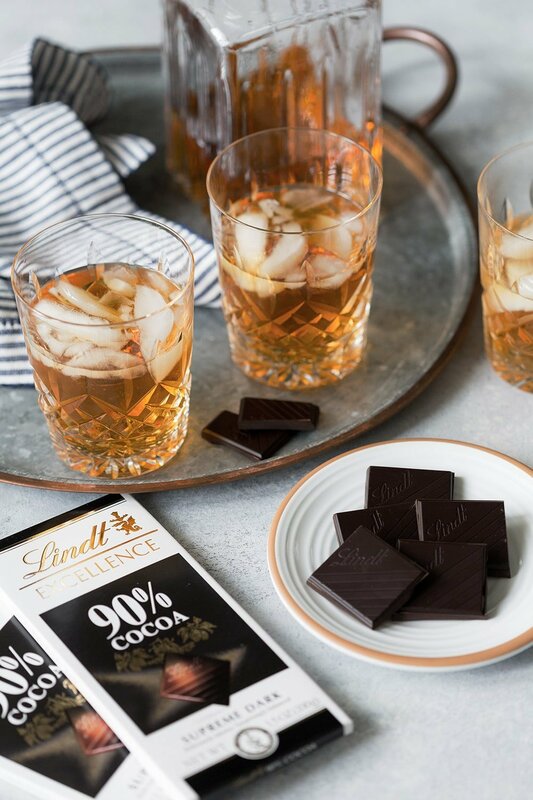 These pairings were created by the Lindt Master Chocolatier so they’re masterfully tailored to pair well with Lindt Chocolate. You’ll have to tell me your favorite pairing in the comments below! My personal favorite pairing, the Lindt EXCELLENCE 70% is one of my favorite chocolates. Paired with a Cabernet Sauvignon? I could enjoy this every evening! This Cabernet Sauvignon from Josh Cellars offers a palate of bright red cherries, blackberry, vanilla, and subtle toasted oak. 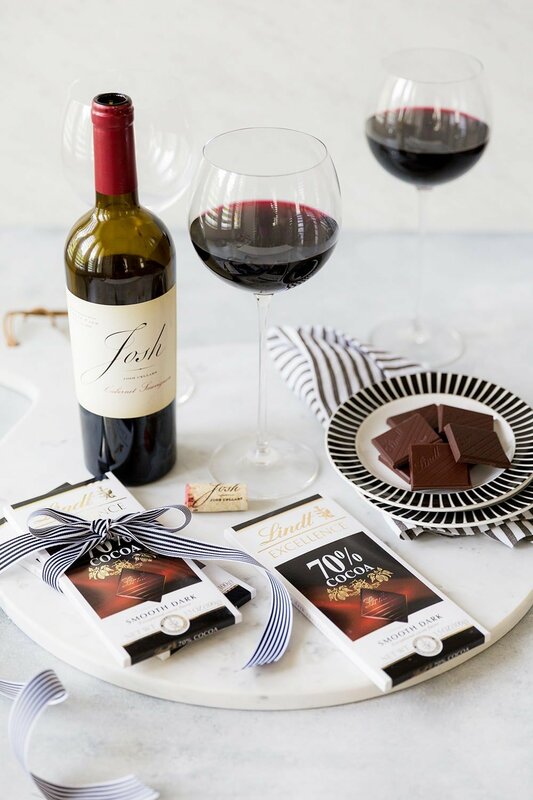 Pair it with the balanced and rich EXCELLENCE 70% Cocoa, a full bodied dark chocolate featuring notes of red currants, leather, and roasted nuts. They are a match in both depth and body. They share a long finish and a creaminess that coats the palate. This pairing is pure summer perfection, in my book. A chilled Riesling and the EXCELLENCE Intense Orange feels like a beach vacation. It’s a must try! Enticing notes of pear and honey are present in this bright and aromatic wine. It is the ideal match for the sweet citrus profile and equally complex EXCELLENCE Intense Orange. Full fruit flavors and a balanced seam of refreshing acidity work in harmony to create perfection. This pairing would make a fabulous start to a larger “cheese and chocolate board” with extra chocolates, cheeses, crackers, fruits, etc. Check out this centerpiece chocolate board I created for Father’s Day for a few more ideas! Aged Gouda is complex. It’s sharp yet sweet, delivering an intense almost salted caramel taste profile. 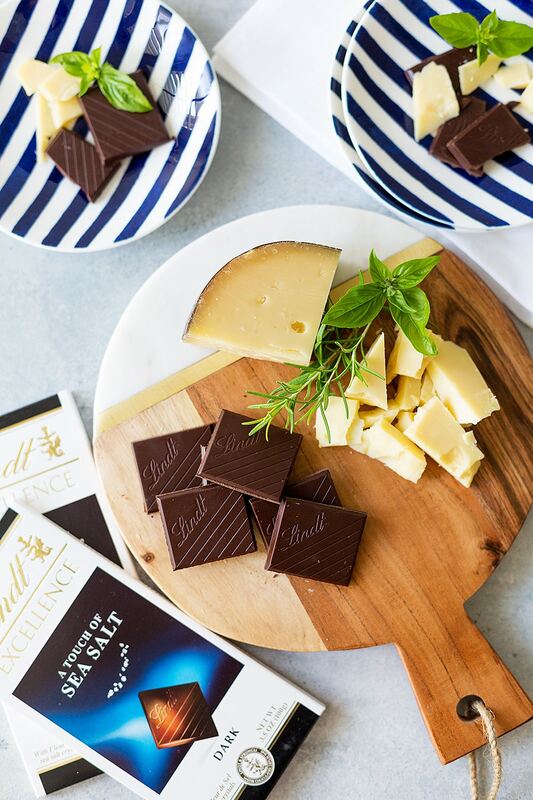 Lindt EXCELLENCE Touch of Sea Salt pairs beautifully with Aged Gouda. The dark chocolate has the right amount of cocoa to compliment the cheese while the fleur de sel (hand harvested French sea salt) adds texture and enhances the flavor experience. My husband’s personal favorite, he absolutely loves this pairing! One year, I hosted him a “Scotch” themed birthday party, and I’m pretty sure I need to recreate it with this chocolate pairing this year! This masterful pairing is for the true dark chocolate connoisseur and scotch whiskey lover. The earthy, toasted nut, and licorice profile of EXCELLENCE 90% melds beautifully with the spicy and sherry nuances of the liquor. They are a perfect match in flavor intensity, balance, and length of finish. This pairing is rich, powerful, and bold. Neither the scotch whiskey, nor the chocolate lose their uniqueness. Tasting them together is an elevated and superb experience. Use various food boards to organize all the chocolate pairings. This can include marble boards, wooden boards, trays and platters. Be sure to include enough tasting glasses or plates for all your guests. Print out tasting note sheets for your guests to write down their own flavor combinations. Include a few palette refreshers like crackers and water. 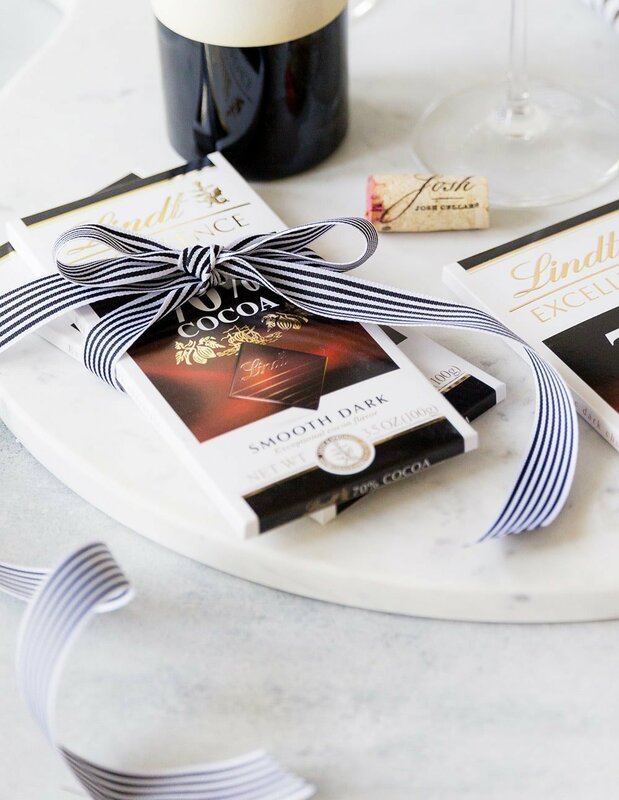 Wrap a few extra Lindt EXCELLANCE bars with a pretty ribbon as a favor. This is such a fitting favor, and your guests will absolutely love it! Are you already ready to invite all your friends for a pairing party? Try out these pairings above and create a few of your own for your friends and family to try! 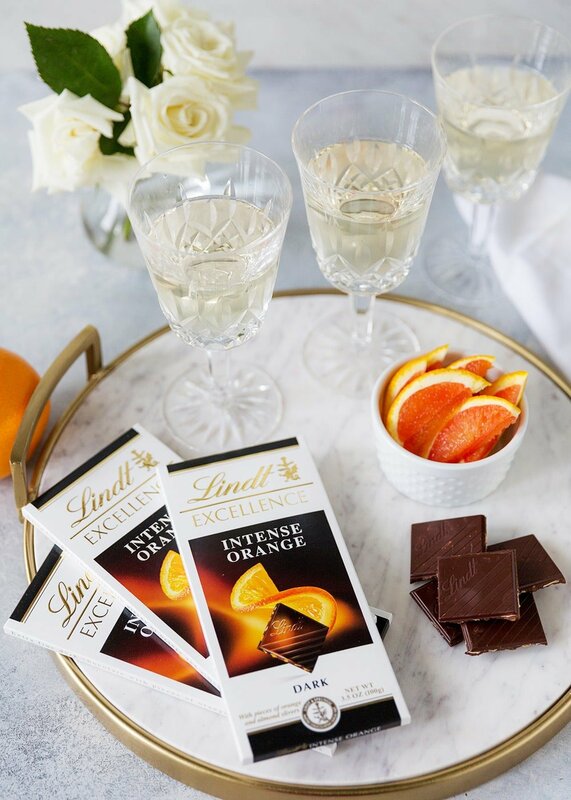 Check out all the Lindt EXCELLENCE flavors here. Find Lindt Chocolate in your favorite retailer, in a Lindt Chocolate Shop near you, and on Lindt.com.